Colorful Yard Signs are a powerful and portable tool for quickly placing outdoor advertisements and messages for a business or special event, and we offer a variety of single sided and double sided yard signs that are easily set in to the lawn or along the road side. Our most popular 18”x24” size can be an effective advertising solution for contractors, realty companies, lawn care services, landscapers, and other service providers and small businesses. They also work beautifully for personal use such as holiday greetings, new baby announcements, or just about any message you wish to share. The light weight of our yard signs makes them easy to move around and place almost instantly, and they are well suited to most weather conditions. The actual sign panel can be changed quickly and is so affordable that it often makes sense to have several panels printed and assembled in advance for opportunities when you want to place your signs. 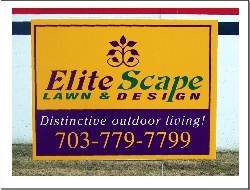 And best of all...These promotional yard signs ship FAST! Approximately 3 days after proof approval on average. We make Yard Signs using one of two manufacturing processes. The first process is by Direct Digital Printing. Using this process we print directly on 4' x 8' sheets of 4mm Coroplast. If you order 18" x 24" signs, the minimum order would be 10 signs, since we print 10 of these signs on a 4 x 8 sheet (you can see more detail on the link below). This produces a very nice & cost effective sign. The second process is by digital printing on vinyl film with an adhesive backing and than applying the vinyl to the Coroplast. Because the surface of the vinyl film is smoother than the Coroplast, the resulting image is sharper and more brilliant. The advantage of this process is that you can order as few a 1 sign. 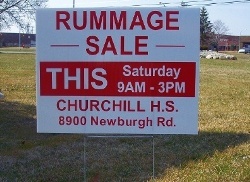 Direct digital printed yard signs are very cost effective. Minimum order quantities depend on the size of sign you order. For example, with 18" x 24" signs it is 10 signs. promote your business or event. You can order as few as 1.